More than 40 dogs were rescued from Michael Vick’s dog fighting ring. Many animal advocates believed the former fighting dogs were too damaged to be saved. But Audie and his kennel mates prove them all wrong. 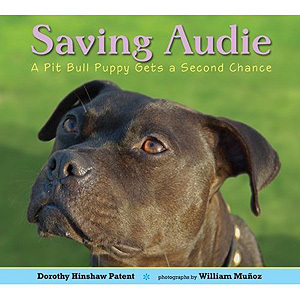 The book gives an emotional and heartwarming account of Audie’s journey from being rescued as a puppy to being rehabilitated and adopted into a loving home. Everyone loves an underdog, but what if that underdog looks scary? This action-packed adventure shows kids that looks can be deceiving and heroes sometimes have to work hard to get noticed. The book also has a green theme, poking fun at our throwaway society. The book inspires the reader to reconsider things they may have thought of as disposable and also to root for the underdog, regardless of what he looks like. Max the Shelter Dog is a hopeful children’s story that addresses the difficult topic of life in an animal shelter for pit bull type dogs and their friends. Full of hope and compassion, the story of Max’s journey, from family pet to shelter resident, will likely inspire young readers to take action on behalf of homeless pets, while building empathy and a sense of responsibility in young readers. 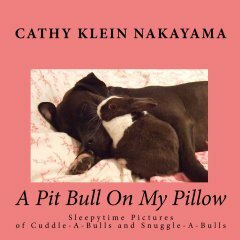 A children’s picture book of pit bull type dogs, most rescued, in sleepy time poses. It also includes some tips about dog care and encourages responsible dog ownership. As an added bonus it get kids who love dogs in the mood for sleep while helping to change the bad rap pit bulls have in today’s society. The photos in the book shows that they are lovers not fighters! The story about Stella, a lonely pit bull who would rather be a graceful pig ballerina than what she really is: a dog no one seems to like. The lovable Stella learns the lessons of self-acceptance, following her heart’s desires and that it’s okay just to be herself. The book includes a CD with an original song written and performed by Bernadette Peters. Inspired by his pit bull Whiskey, Hopf’s Doggieville follows the adventures of Kiki on his journey home to his beloved best friends, Scarlette and Savannah. The book follows the travels of Kiki as he journeys across the highest mountains and widest oceans. The story is one of unconditional love and sacrifice. Found in an abandoned home, Ruby achieves celebrity status, which has taken her and her people on a wonderful odyssey. Ruby is a service dog, a veteran of stage plays, worked at a radio station as a co-host and has appeared in newspapers around the world. Ruby’s Tale was the winner of the 2011 National Indie Excellence Awards. When Larry Levin and his twin sons took their terminally ill cat to be put to sleep, they saw a puppy that was used as bait for fighting dog. He was missing an ear and his face was covered in scar tissue. The dog ran up to the family and captured their hearts. 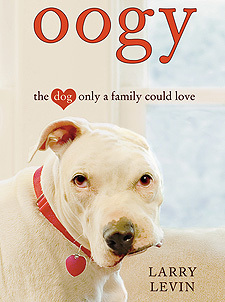 The Levins, whose sons are themselves adopted, were unable to resist Oogy’s charms, and decided to take him home. The heartwarming story tells of Oogy’s journey against all odds that landed him in a home filled with love. Cash, the pit bull, is won in a poker game and lives with an 11-year-old boy, Mackenzie and his distant father. Mackenzie and Cash take care of each other in their rough neighborhood until the the father kicks the dog out after defending the Mackenzie against one of his father’s rages. Cash survives on the streets and performs brave deeds that help change perceptions about pit bulls. All the while, Mackenzie and Cash search for each other. I stood in Barnes & Noble scanning/reading Dog Lost. When I started to cry, I stopped reading. The question in my mind as I put the book back on the shelf was, “How can people hate Pit Bull-type dogs when people do so much worse to each other?” The abuse the boy suffers at the hands of his own father is right on par with the abuse suffered by the dog in the book. I would recommend this book for much older readers. It would have been too much for my 8 year old, in my opinion. @adevans0220 Thank you so much for your comments, we too think it is best for older kids. I’ve read all these books to my grandkids, ages 3/4/4/5. We love them. We have a pit bull, 2 great danes, and a dalmatian, and I work at an animal shelter. I want them to grow up with compassion, and not making judgements on people or animals, I also take them to the shelter all the time. We were all at starbucks yesterday, drinking coffee outside. There was a pit bull tied to a tree waiting for her owner to come out. All my grandkids sat on the ground feeding her pound cake and kept her company until the owner came out. Most people that passed by said “be careful, that’s a mean dog”. They all just laughed and said, “No it’s not, it’s just a pit bull”. We also have “Reading with Rover” at the shelter, a reading group for kids, and we bring shelter dogs in for them to play with. Hopefully this generation will be smarter than their parents about pit bulls. We’re trying! @bigdogclaire Thank you for sharing that, you have definitely positively affected your grandkids’ feelings about pit bulls, so maybe there will be hope for that generation. Keep up the good work! Oogy is NOT a Pit Bull. He is a Dogo Argentina. Please correct this misconception. Thank you!